By focusing on how best to help patients, researchers can sometimes find solutions that are much simpler than anticipated. That has been the guiding approach to our efforts to develop a treatment for sickle cell disease. Sickle cell disease is a devastating hereditary condition afflicting millions of people, particularly in West and Central Africa as well as those of African descent in the United States and South America. The disease involves normally round soft red blood cells being deformed into a rigid form. This change brings severe pain, life threatening infections and organ damage. In some parts of central Africa, as many as one person in 50 is born with the disease; about 90 percent of them die by the age of five and 99 percent by the age of 20. About 4 million people in West and Central Africa suffer from the disease; from 500,000 to 1 million people in South America and about 100,000 people in the United States, where about one in 500 African American children are born with the condition. People with only one copy of the sickle cell gene are said to have sickle cell trait, which in some cases may cause far milder symptoms. Sickle cells die faster than normal red blood cells, and the body cannot replace them fast enough, leading to anemia. Normal red blood cells live for about 120 days before they are replaced with new ones. Sickle-shaped cells are destroyed in about 16 to 21 days. In addition, sickled red blood cells tend to clump together and stick to the arterial walls, blocking blood flow and leading to pain, sores and organ failure. Red blood cells contain the protein hemoglobin, which transports oxygen to other body tissues. Normal red blood cells contain hemoglobin A and remain round and smooth when oxygen is released. In contrast, the bone marrow of people with sickle cell disease produces red blood cells with a different form, hemoglobin S, which stands for sickle. As these cells release oxygen, instead of remaining smooth and flexible, they become rigid, inflexible and sticky. The complications of sickle cell disease occur when these rigid red blood cells block veins, causing pain in the arms, legs, back and stomach, bones, skin and other parts of the body. Tissue that does not receive normal blood flow eventually becomes damaged. There are several types of sickle cell disease. The most common are sickle cell anemia, sickle-hemoglobin C disease, sickle β0 thalassemia and sickle β+ thalassemia. Sickle hemoglobin C is a form of sickle cell disease characterized by the presence of two abnormal types of hemoglobin, S and C.
People with sickle cell trait usually show no symptoms, but can experience limitations with heavy physical exertion. Currently there is no universal cure for sickle cell disease. Treatments primarily include pain medication and hydration, hydroxyurea, which decreases the incidence of painful crises but is often not well tolerated, and bone marrow transplant, which is costly and has limited availability. The average annual cost per patient was $10,704 for children 9 and under and $34,266 for adults 30 to 39 years old. Over the years, thousands of medications have been proposed for treating sickle cell disease, but most of them were eliminated at the pre-clinical level. Only about 80 medications have actually entered into clinical trials, and only three have made it into Phase III trials. Our approach has been very different from that of other researchers. Many scientists have been looking to treat or cure sickle cell disease from the genetic perspective. However, sickle cell gene therapy remains very difficult and may take many more years of research. In the meantime, patients are still suffering. Our goal has been to find an effective means to control the symptoms in a manner roughly analogous to diabetic medications for treating diabetes. It is an approach suggested by my mentor, Dr. Charles R. Zerez. To do so, we began by studying the dynamics of sickle cells. That line of reasoning led us to look at anti-oxidants. Red blood cells have their own anti-oxidant, a nucleic acid called NAD (nicotinamide adenosine dinucleotide). The research by Dr. Zerez showed that sickle red blood cells tend to have a decreased NAD redox potential compared with normal cells. At the same time, sickle cells have an increased rate of NAD synthesis. This was interpreted as a means by the cells to compensate for increased oxidant stress. One of the ways that we decided to approach this was to give sickle red blood cells more raw materials to produce these anti-oxidants. Sickle cells demonstrated tendency to draw in these raw materials very rapidly. Then, with the additional raw materials, they had increase in the formulation of the anti-oxidant NAD. Glutamine has been shown to play an important role in the redox status of sickle red blood cells, which were taking in glutamine at an unusually high rate. The evidence suggests that glutamine is used in sickle cells to produce the anti-oxidant molecule NAD. Our research has since focused on using L-glutamine, an inexpensive compound widely consumed as part of a normal diet or as a dietary supplement. Our observation was that orally administered L-glutamine increased the NAD redox potential of sickle red blood cells, making them much healthier. Among patients treated with L-glutamine in the study, there were subjective reports of improvements in regards to chronic pain and energy levels. In sickle cell disease, many of the complications and much of the suffering can be linked to the tendency of sickle red blood cells to stick to the endothelial cells that make up the inner lining of the blood vessels. This slows the travel of the red blood cells through capillaries, which often leads to blockages, or vasoocclusion. This blockage causes pain, inflammation and organ failure. With grants from the FDA and the National Institute of Health, we were able to move forward into Phase II trials, which completed in 2008. The 57-week, randomized, double-blind clinical study was completed by 30 patients at five sites. The Phase II trials demonstrated a major trend toward a reduced frequency of painful sickle cell crises for the treatment group. In addition, the frequency of hospitalizations decreased significantly. The subjects in the placebo group experienced painful sickle cell crises at 30 percent to 149 percent higher frequency than the L-glutamine group. The hospitalization rate among the placebo group was 31 percent to 52 percent higher as well. Anecdotally, chronic skin ulcers healed in three patients receiving L-glutamine, while none in the placebo group had such changes. No major side effects were noted, nor were there any deaths or severe adverse events attributable to the L-glutamine treatment. At the conclusion of the Phase II trials, we met with the FDA for the “End of Phase II meeting.” During that meeting, we were authorized to move forward to the Phase III trial with a larger enrollment than that of the Phase II. Enrollment in the Phase III trial began in 2010, and the study is expected to be completed in the year 2013. The 57-week clinical study involves about 225 patients at 30 sites across the United States. Most of the patients are of African descent, although there are some Hispanics involved also. Two-thirds of the patients are receiving L-glutamine and one-third a placebo. The study data will be reviewed and analyzed by various committees; then the results will be submitted to the FDA. The FDA has granted fast track status to this project, meaning the agency is obligated to give a response within six months of the receipt of the data. L-glutamine therapy has also received orphan drug status from the FDA in 1997. Furthermore, more recently, it has received a positive opinion from the European Medicines Agency on European Orphan Drug Status. Orphan drug status confers seven years of marketing exclusivity after the approval of the medication in the United States and 10 years in EU member countries. Also, it provides a streamlined regulatory review process and fee reductions. We are hopeful that this process will enable us to obtain FDA approval by late 2013 or early 2014. Sickle cell disease causes a great deal of suffering for millions of people, particularly the young. We were convinced from an early point in our research that this treatment could make a substantial difference in the lives of sickle cell patients. An early challenge in our research was convincing people that a treatment as simple as oral L-glutamine therapy could help patients. While a genetic cure may one day be found, soon we hope to be able to begin to alleviate the suffering that patients are experiencing today. Yutaka Niihara, MD, MPH, is Chief Executive Officer of specialty pharmaceutical company Emmaus Medical Inc. and principal inventor of the patented L-glutamine therapy for the treatment of sickle cell disease. 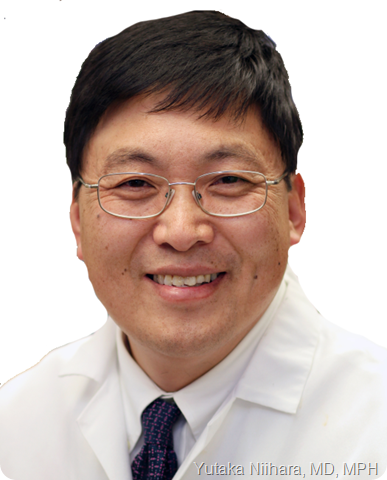 Dr. Niihara is a Clinical Professor of Medicine, Division of Medical Oncology/Hematology at David Geffen School of Medicine at UCLA. am so happy to hear this pray it will be a successful will glad if there should be an affordable treatment for sickle cell disease. my daughter suffers of sick cell....we hope that God will give a solution to treat it and cancel this terrible pain...thank you to work on it. God bless you! Good News and Hope !!! Thank you Dr. Niihara for this amazing information. You and your team are God sent to sickle cell patients. My 9 year old daugther has sickle cell anemia and it has been very hard on her and my entire family. Her ailment has completely changed our lives. I pray that your research becomes a huge successful and brings forth a final break-through treatment for sickle patients. This will help to reduce the pain and torture my dear child is suffering. From the depth of my heart I say thank you to you and your entire team- May the good Lord guide, direct and see you through this work to a successful finish. Be blessed always. Definitely Long Overdue Much Appreciated Research & Outcomes! As a patient with Sickle Cell-Beta Thalassemia, your amazing results are much appreciated and will be passed along to physicians (especially hematologists) and social acquaintances interested in this area of investigation. Many Thanks and God Bless you & Your Team.